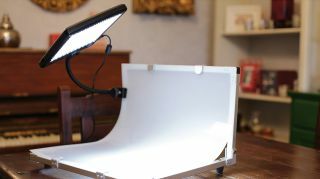 Unlike flashguns that provide short bursts of light, LED panels are a camera accessory that deliver a constant source of illumination, often with various extra options. You may be considering adding a panel to your setup but want to weigh them up before taking the plunge. With that in mind, we've had a look at six current models to see which offers the best value for money. These LED lights mount to your camera's hot shoe where you'd otherwise attach a flashgun. They're ideal for on-the-go shoots where portability is paramount. The Rotolight NEO 2 is rated for a whopping 2,000 lux maximum brightness at three feet (91.5cm). We couldn’t quite match this, measuring a peak 1,840 lux at 4,000K, but that’s still noticeably brighter than most competitors. Brightness does drop to around 1,100 lumens at each end of the 3,150-6,300K temperature range, but this is the only issue we found. The dual control dials adjust a plethora of easy-to-set options. Six AA batteries sustain 90 minutes of full-power continuous illumination, or there’s a mains input. You can even use the NEO 2 as a flash, with up to 500% more brightness than in continuous mode. At this price, is this panel too good to be true or an absolute bargain? NanGuang’s offering is power rated at a potent maximum 1,600 lux, and it’s also colour adjustable, with a 3,200-5,400K range. Two dials set light power and colour temperature, with one dial controlling the power of the 3,200K LEDs and the other operating the 5,400K diodes. To get a colour temperature in between, you’ll need to balance both dials, which can be fiddly. Crank both to the max and the LEDs give a 4,100K combined output, which we measured at a blinding 1,720 lux, though this does drop to 950 lux with only the 5,400K LEDs active, and 826 lux at 3,200K. Light spread is average, matching the Metz’s 420 lux reading at 30 degrees, but falling off beyond that. Metz engineers have tuned the Mecalight L1000 BC to output a consistently high 1,000 lux brightness at one metre from 2,800K through to 5,700K. And it works: we measured a constant 1,180 lux across the temperature range, and an impressive 420 lux at around 30 degrees off-centre. Given this attention to detail, and the presence of a small OLED display on the rear panel, it’s a pity the colour temperature readout is very basic and not quoted in Kelvins. Like the Croma2 (below), power can come from an L-type li-ion cell or 6 AA batteries, but the latter are inserted into a bulky – if waterproof – holder that sticks out from the back of the panel. The Manfrotto Croma2 offers adjustable colour temperature, which can fluidly transition from 3,300 to 5,600K. Both temperature and power are adjusted with simple dials with no scale markings, so repeating the same settings from shoot to shoot is difficult without a light meter. We recorded light power figures of 750 lux at 3,300k and 900 lux at 5,600K. With both sets of blue and yellow LEDs active at 4,550K, brightness peaks at 1060 lux. Despite a quoted 50º beam angle seeming slightly narrow, real-world use demonstrates a decent light spread. Power can come from the mains, or through two battery options. It may be small, but the Lume Cube is tough. The mostly metal shell feels very solid and able to shrug off plenty of abuse, and it’s waterproof down to 30m. There isn’t much room for controls though, with only one button to turn the light on and cycle through 10 brightness settings. Fortunately, the Lume Cube can be wirelessly controlled by your smartphone via Bluetooth. Somehow a rechargeable (but inaccessible) battery has been crammed inside, giving two hours runtime at 50% brightness. Light output is quoted at only 150 lux, but that’s from three metres. We recorded a respectable 580 lux at the more typical one-metre measuring distance. Rather than using bulky AA batteries, the Kaiser SmartCluster Midi is powered by a compact, non-proprietary 1,800mAh li-ion battery that’s good for 90 minutes of full-power illumination. The battery is included, as is a basic hotshoe swivel mount, along with warming and diffusion filters. With a lighting power of just 190 lux at 1 metre, illumination is noticeably dimmer than the opposition. Power may be lacking, but the light quality is attractive, with a measured 5,700K temperature being very close to spec and looking pleasingly neutral. If you only need to light close subjects, or are willing to shoot at higher sensitivities to compensate for its low power, the SmartCluster works well. Need something with a bit more power? Here we've got larger LED panels designed to be mounted on a light stand or tripod. They're great for shoots like portraiture, or for lighting actors in stationary scenes, and for interviews. Also named the Studio Essentials 600 Bi-Color in some markets, this 32 x 32cm panel can output 4020 lux at 3 feet and has an adjustable 3200-5600K colour temperature. The latter isn’t completely stepless, but in most real-world shooting scenarios, that’s no big deal. Maximum power is also nothing special on paper, but again, unless you’re out to overpower the sun, you’ll find it more than enough to light most subjects at a reasonable distance. What impresses most about this panel is how rugged the build is for the money. The exterior casing is almost entirely metal, and you get a set of metal barn doors and a pair of filters thrown in. The metal yoke cradle is equally stout, and there’s plenty of ventilation holes so the LM8 can do without a cooling fan. Round the back you’ll find a standard V-mount connector to fit an optional battery if you need portable power, and you even get a small - if relatively dim - status display showing current output intensity and colour temperature. Think of the AEOS as the big brother to Rotolight’s compact hot-shoe mountable NEO 2 LED light. The AEOS is designed to be mounted to a light stand for studio use, but it also features a pair of sturdy metal handles if you’re lucky enough to have an assistant to hold it - and at just 1.4kg and a compact 30cm diameter, that’s a genuine option. Max power output is a literally eye-watering 5750 lux at 3ft, and the LED colour temperature is steplessly adjustable from a warm 3150K through to a daylight-balanced 6300K. Rotolight’s emphasis on quality continues with a high colour rendering index of over 96. An easy to read rear display shows the current light intensity and temperature, both adjustable by dedicated control dials. Push these and you reveal the AEOS’s extra features. They include a High Speed Sync flash mode with double the power of the maximum continuous light output, and special effects to emulate flickering fire and emergency vehicle lighting. Mains power is the standard juice, but you can go off-grid with a rechargeable power pack capable of a 3-hour runtime, albeit for an extra £275/$300. If you’re after a truly portable off-camera LED panel, the Luxpad certainly fits the bill - and in most kit bags. At a mere 35 x 24 x 3.2cm (excluding its mounting bracket) the 43H is an almost identical length and width to a 15” MacBook Pro, and at only 910g, around half the weight. Max power is pegged at 1412 lumens - nothing that’ll out-power the sun, but it’s plenty for home studio use, plus at this price, you can double up on Luxpads without breaking the bank. Power output can be dimmed down to 0% but the process isn’t particularly fluid, especially at dimmer settings. However you do get selectable colour temperature ranging between 3200K and 5600K, and this adjustment is surprisingly stepless. A multi-voltage AC adaptor is included, and the Luxpad’s rear panel has mounting points for two optional Sony NP-F type rechargeable batteries, of which third-party variants are readily available and reasonably priced. You can even spec an optional adaptor that allows you to power the Luxpad from 6 AA cells. Litepanels has a reputation for producing quality kit aimed at semi-pro videographers, and the Astra 6X panel certainly feels like a quality product. At 3.2kg it’s designed solely for stationary light stand mounting, but the aluminium yoke cradle is very tough, as is the XLR power input connection, plus there’s a quiet cooling fan to ensure the longevity of the electronics and 256 individual LEDs. These are guaranteed to be flicker free regardless of the frame rate at which you record, and they can be fluidly adjusted in colour temperature from tungsten through to daylight. The panel manages an impressive minimum colour rendering index of 95 at the tungsten end, rising to an incredibly accurate 98 when outputting daylight-balanced illumination. Outright power is also formidable, as the Astra 6X manages a huge 6330 lux at a distance of 5 feet, and it’s steplessly adjustable down to 0% with no colour shift. The AC adaptor is neatly integrated into the yoke, and optional adaptor plates are available for attaching a Gold Mount or V-mount power pack. With its ¼-inch mounting point, the Lykos is intended to be attached to your camera’s hot shoe, rather than perched on a light stand, but it can be equally well positioned on a standard tripod if you need off-camera lighting. At 26x15.2cm, it’s very compact, yet packs a useful 1500 lux (at 3.3 feet) max brightness output, making it well suited to indoor shoots. As the name suggests, there’s also variable colour temperature, from a warm 3000K through to daylight 5600K, thought the colour rendering accuracy of 93 isn’t quite as high as some rival panels. Both power and colour temperature are adjusted by two dials on the side of the panel, and the rear has a single mounting point for an optional Sony NP-F-type rechargeable battery. The rear info display is also handy for things like matching the colour temperature across multiple panels. Speaking of which, add the optional Lykos Bluetooth Dongle and you can remotely control one or more Lykos panels using an iPad and Manfrotto’s Digital Director remote photography software. At first glance this pair 60x30cm LED panels seems fairly ordinary, until you realise each is only 2mm thick and can be easily wrapped around smaller subjects for enveloping illumination. If you’d rather use the panels in a more conventional set-up for lighting portraiture, they can mounted side by side in a 60x60cm configuration supported by an included tubular frame and velcro attachment straps, or there’s a 120x30cm frame if you’d rather get a full-length shot of your model. On their own the panels weight just a few hundred grams, but mounted in the frame that rises to over 1.5kg, though this is still respectable given the large surface area. Trouble is, once you’ve packed everything into the sturdy included carry case, your left with a hefty and bulky 6.5kg package that’s the least portable option here. Thankfully you do get a plenty of tech packed in, including stepless colour temperature adjustment from 3200K to 5600K, and an impressive CRI rating of 95 for accurate colour rendition. Power output is rated at 3424 lumens, but that’s no match for the Rotolight or Litepanels lights, especially outdoors.